Trained as a schoolteacher and lawyer, Johnson collaborated with his composer brother, John Rosamond Johnson (1873–1954), on many popular songs, including “Lift Every Voice and Sing,” which became a kind of African-American anthem. In 1906 President Theodore Roosevelt appointed Johnson U.S. consul to Puerto Cabello, Venezuela, and in 1909 he became consul in Corinto, Nicaragua, serving until 1914. His 1912 novel, Autobiography of an Ex-Colored Man, became a classic of African-American literature and was an acute analysis of race relations in the United States. 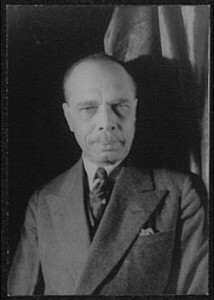 Johnson was a major figure in the National Association for the Advancement of Colored People (NAACP), published his own poetry, and compiled major anthologies of African-American poetry and spirituals. His poetic masterpiece is God’s Trombones (1927), poems written in the form of black dialect sermons. Posted on June 22, 2016 by Natalie. This entry was posted in Uncategorized. Bookmark the permalink.